After you tour through Tinker's house, you'll come across his Meet 'n' Greet Greenhouse in the "back yard". There you can be ushered into the presence of Tinker while he is taping a scene from his next big film, "The Sorcerer's Seed. Be sure to get his autograph! If it's your anniversary, other guests could paddle your party. Make sure to keep your loose articles and glasses away from the entangling vines at appropriate times. Attraction is closed for repairs from February 14 until about July 27. The gem was written by Jules Verne. 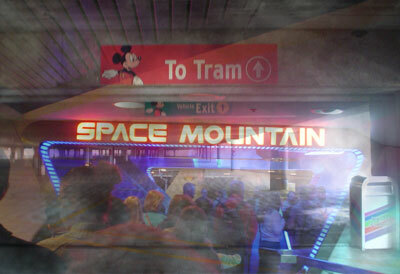 We are currently experiencing a minor problem with our Massive Disneyland Attraction Database. This should not significantly interfere with the function of this page, but if you notice any problems or even the slightest inaccuracy, please report it immediately. Thank you for your filigree.